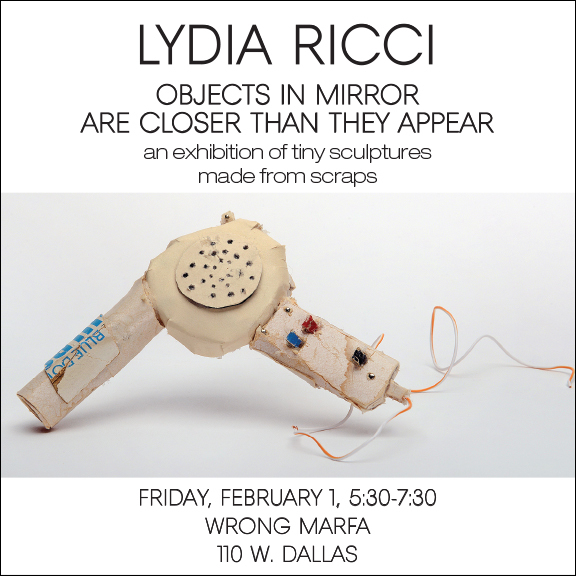 Lydia Ricci’s tiny sculptures will be exhibited at Wrong Marfa February 1 through the end of March. The show opens Friday, February 1, 5:30-7:30 at 110 W. Dallas. Lydia has been collecting scraps for more than 25 years. Gathered from crowded junk drawers, dusty supply closets, and the occasional neighborhood trash can, she transforms the ephemera of existence into tiny tributes to time past. Her tiny sculptures are made from paper, glue, broken staples, and the back-side of almost anything. These collage-like sculptures of everyday objects aren’t precious or precise miniatures, but rather rough-and-ready approximations that somehow feel more true than exact recreations. They’re messy and imperfect —just like our memories. Presenting these familiar objects at unfamiliar scales evokes a sense of wonder and hazy nostalgia that inspires viewers to imbue these fragments of our shared past with their own meaning. When she’s not creating vintage typewriters from cereal box lids and floppy disks, Lydia teaches courses in branding, design, and storytelling at the University of the Arts in Philadelphia. She is a graduate of Carnegie Mellon University, and has also studied in St Gallen, Switzerland and Cortona, Italy. She lives outside Philadelphia.